Japanese cuisine is very different than any other cuisine around the world. The food and its cuts affect the taste of the entire dish and hence the chef’s use the best Japanese kitchen knives for the preparations which is tough to perform with other knives. If you are someone who is looking for a good Japanese knife and want to know the details about it then we have all the information that you need to know. 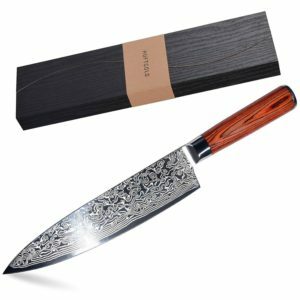 Below we have listed some of the most spectacular and top on the market, Japanese knives, that will surely live up to your expectations and help you prepare Japanese meals like a professional. But first, let’s look at some basic things that you need to know about the japanese kitchen knives before you buy one. 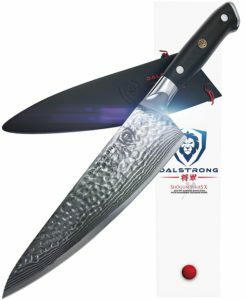 What really is the best japanese kitchen knife and why is it so superior than any other ordinary ones? The Japanese are very skilled at their knife making craftsmanship. the process of making high-grade knives required very skilled workers and extremely radical tools. The Japanese are renowned for making samurai swords or also known as Katanas which is how they earned their reputation for crafting high quality and ruthlessly sharp knives. By the late 16th century, they took a path of making general knives apart from crafting swords and slowly became well reputed in this sector. Their knives are well known for its longevity and performance which is why this is a must have the tool in any Japanese kitchen around the world now. Best japanese chef knives are very different from their western competitors. The Japanese knives are made to be more delicate and each one has a specific task and application. These knives are sharper and made from hard steel so that each cut can be precise and proficient. The blades in each knife have a distinct task to perform with the utmost precision. On the other hand, the materials used in the knives of their western competitors are slightly different. 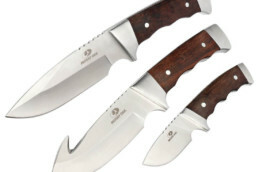 These knives have are more like an all in one version of the Japanese knives and crafted to be used as a multipurpose knife hence, you can chop, slice, dice, and skin with one single knife. The Japanese cuisine is all about that precision in the cuts of meats, vegetables, and fishes which is why a high-grade knife is an absolute stable tool in any Japanese kitchen. We all love Japanese food and let’s admit, we all try to recreate Japanese dishes at our home as well. 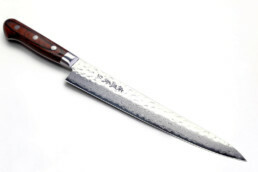 So, if you love Japanese cuisine, you must have one this knife. 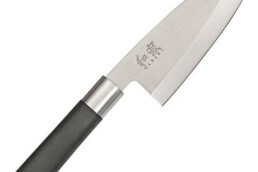 Shun has crafted this classic chef’s knife especially keeping the Japanese culinary in mind. 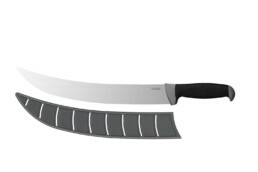 The 8-inch knife has been designed to slice, dice and chop with precision. The razor-sharp blade is made up from 32 layers of high-grade carbon stainless steel forged into one. The patterned surface with the stylish Damascus steel outlook is highly durable and rust proof. 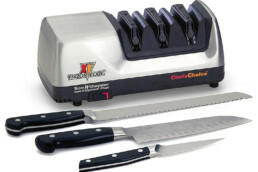 If you are looking for a razor-sharp slicer then this knife safe to invest your money in. Not only does it have a super stylish outlook but it is one of the most premium and high-end kitchen tools that you will find in the market. The black pakkawood handles give you comfort and balance while chopping and is absolutely slip-proof. 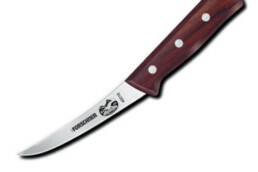 Although this knife is at the higher price scale we can assure you that it is definitely worth it. 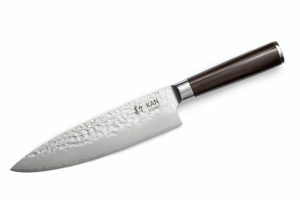 KAN is one of the well-known brands who craft the best japanese chef knives in the world and the AUS 10 KAN chef knife is one of the best that you will find out there. Well, you all must be wondering that how is this knife so special and better than any other ones. This knife has been built with special Japanese AUS 10 steel which is the absolute best material for knives. The AUS 10 coating makes the knife extremely rigid and strong plus it prevents the blades from becoming fragile over time. So you can rest assured that this knife will last you a long time. The core alone has been made by forging the layers of 66 Damascus stainless steel which makes the knife very resilient and also adds on a unique pattern and look to the knife. For retaining the optimal performance of the knife it is necessary that it balances at a tweak. To keep the knife balances while cutting the handles have been made with dark wood. 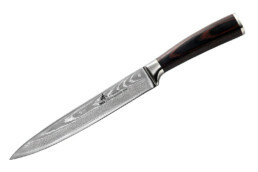 However, you do need to take special care of this knife if you want to maintain its quality. You will have to hand wash it and wipe it dry as soon as you are done to keep its quality intact. Whenever we talk about Japanese knives, there is this instinct that automatically lingers through the mind, that this knife must be really sharp like a razor blade. Well, this brand we are going to talk about really lives up to that expectation. Kessaku manufactures amazing professional chef knives of the most superior eminence. The samurai series knife by Kessaku is one of their very best creations that can slice up anything with absolute precision. This samurai knife is specially made to suit all your culinary requirements and is made with the finest of material with a cutting edge technology. The material used for the construction of this beauty is very high-grade carbon stainless steel which prevents the blade form any kind of discoloration, rust or corrosion plus gives it a shiny look. When handling a knife it is vital that the handle is comfortable to hold otherwise it is a pain to work with for a long time. Kessaku has kept that in mind and constructed it with proper ergonomics in order to provide you with ease and comfort while handling the razor-sharp samurai knife. Well, there is one more thing that we all love and that is packaging. When you invest so much in a single pair of knife you do expect that it comes in some special packaging as well. You will not be disappointed as this knife comes in a beautiful box with magnetic closure that is perfect for storing the knife in after use and also makes an amazing gift box as well. It is a knife that you can blindly put your faith in and we can guarantee that you won’t be disappointed with the performance. This beautiful hammered Japanese knife belongs to the Shogun series X by Dalstrong, one of the most reputable cutlery and knife brand in the industry. This is vacuum treaded slicer appropriate for chopping and slicing food with precision. This knife is practically every chef’s dream come true. The knife has been manufactured with a cutting edge technology and appraisable craftsmanship. If you want a knife that is almost brutally sharp and can slice anything up like butter then you will have to put your money in this one. Dalstrong never fails to awe everyone with their outstanding performance and quality. The Japanese steel that has been used to craft this knife has been vacuum treated to give this blade the ultimate strength and durability. 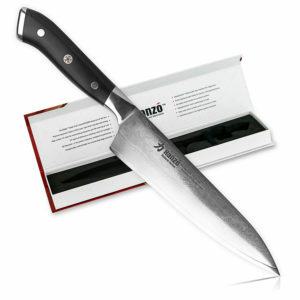 In addition to that the knife has 66 layers of high carbon stainless steel that makes it sharp and shiny. The handle has been made with military grade materials so that it retains its durability for a long time and is very comfortable to hold and work with. We know this one is on the higher price scale but trust us it will be worth the investment as this knife will undoubtedly last you for years if you take good care of it after use. 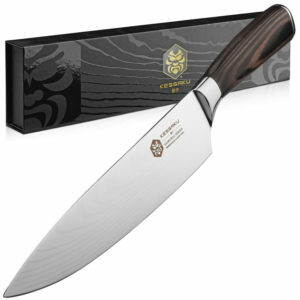 TOKAGEH has crafted this spectacular, professional grade chef knife that meets all the Japanese culinary requirements. The 8-inch blade is ruthlessly strong and sharp as it has been made form the finest materials possible. If you are looking for a knife that not only delivers superior performance but also has that sophisticated and classy look than this one is just perfect. 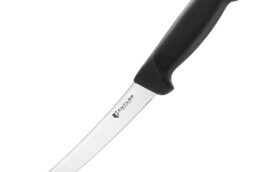 The elegant black handle complements the shiny blade perfectly and gives you perfect balance while slicing the foods. 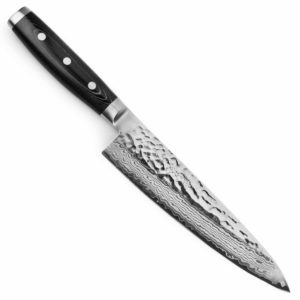 The layers of Damascus steel incorporated in the blade makes it extremely durable and prevents the food from sticking on the blade while chopping them up. You can cut those meats and veggies with the utmost accuracy as this blade has been constructed with an 8 to 13-degree angle on both the sides. This feature enhances the accuracy and precision of the cuts made by the blade. It does fall on the pricy end but trust us you will not be disappointed with its performance. If you have this knife at your kitchen rack you will not reach out to the market for a new one in a very long time. If you love a stylish knife with killer sharpness and quality then you will fall in love with this HUFTGOLD knife at first sight. The mature crafted 8-inch Japanese slicer is ideal to chop, slice and dice with accuracy and hence ideally complements the Japanese culinary. 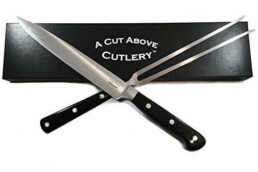 The water pattern on the blades gives it a stylish outlook that will look gorgeous on your knife shelf in the kitchen. Not only is it a complete winner in terms of looks but the quality of performance of this knife will leave you awed. Made from the most high-quality Japanese carbon steel, this knife is an epitome of durability and strength. The 67 layers of steel bonded together makes it super strong and enhances the longevity. 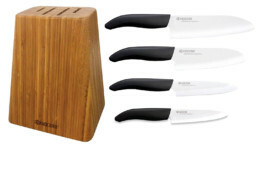 The knife comes in a beautiful wooden box that is ideal for storage and gift purposes. The professional chef knife created by Hanzo is an ideal tool for preparing Japanese food. 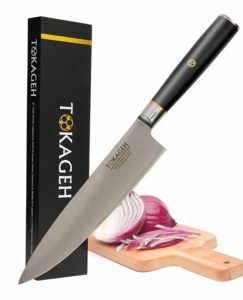 It is an 8-inch Japanese steel tang made with military grade design to give you the advantage of slicing the ingredients smoothly and effortlessly. We all know how annoying it is when the food clings to the knife. But whether you want to slice meats or chop vegetables, this knife will cut flawlessly without any drag or tear and the best part is that it will not stick onto the knife while you work. The premium quality Japanese steel makes the blade super sharp and durable and this knife will last you a long period of time. As important as the blade is, the handle is also an essential part of the knife. Hanzo has put special attention to the handle and built it with the highest quality possible to ensure your comfort and ease while working. It is very safe to put your money in this knife as it will not rust or corrode, neither will it lose its shine over time. Trust us, you won’t be disheartened with its performance. Last but not least, we would like to introduce you to this spectacular Enso chef’s knife which has been specially made for Japanese cuisine and is very much preferred by the professionals. The hammered look from the layered Damascus steels makes the knife look gorgeous. If you are looking for a high end and premium grade Japanese knife then this is the one to go for. 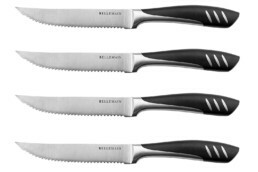 This knife comes in various different sizes and hence you can choose the one that will suit your requirements. This knife has been handcrafted and made to perfection. 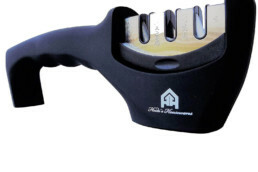 The black handles have been riveted to provide you with safety and a good grip while chopping and slicing. 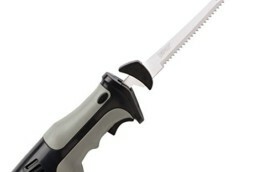 The double bevel edge makes it ideal for both left and right-hand users of the knife. We understand that choosing a single knife from the rack that contains hundreds of other s can be very confusing. Given that these Japanese knives don’t come cheap, it is crucial to know the details about it before you purchase them. We hope that this article will surely help you know all that you need to about the Japanese chef knives and help you pick the most ideal one that suits your needs. Do you use one of these knives? 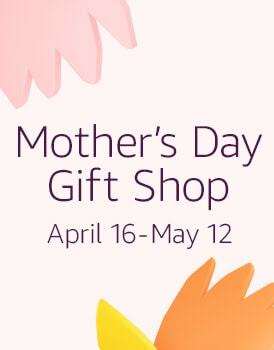 Let us know how you like it in the comments below!